Beautiful pictorial map of the Western Hemisphere featuring vignettes of wildlife, natural resources, and cities. Pictorial Map of the American Continent following the Pan American Highway and showing some of the natural resources, scenic wonders, and points of interest. 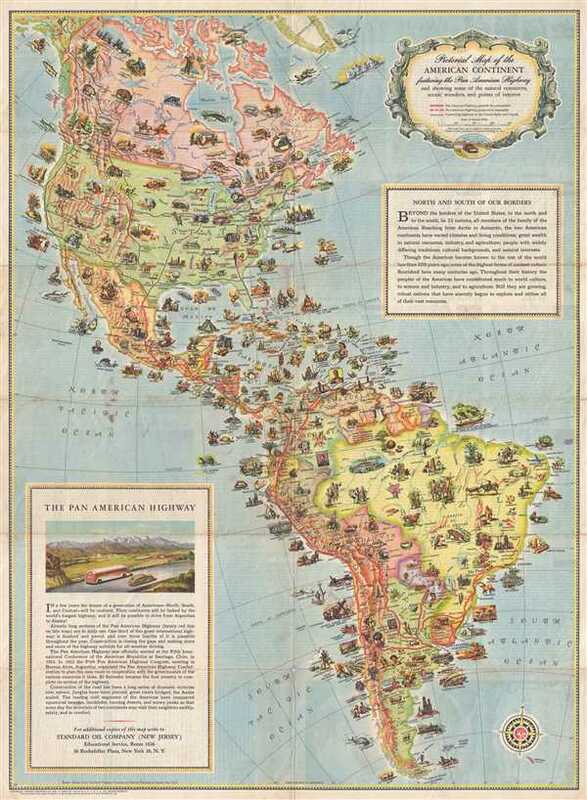 This is a very attractive and beautifully illustrated c.1930 pictorial map of North America and South America created to promote the Pan-American Highway, a network of roads measuring about 29,800 miles in length. Except for an 87-kilometer (54 mile) rainforest break, called the Darien Gap, the road links the mainland nations of the Americas in a single interconnected highway system stretching from Alaska to Buenos Aires, Argentina and Santiago, Chile. Depicting both North, South, and Central America, this map features dozens of vignettes, illustrating popular activities and wildlife found throughout the hemisphere. These vignettes also include views of cities, such as New York, Washington, D.C., Montreal, Quebec, and Buenos Aires. A decorative title cartouche is situated in the upper right corner, along with a second cartouche describing the Americas outside the borders of the United States. Another cartouche, this one situated in the lower left corner, offers a brief history of the Pan American Highway. The verso features a listing of countries and territories outside the US, titled 'Know Your Neighbors Better' and gives a short, detailed history of each country. The map, copyrighted by the General Drafting Company Inc., was published c. 1930 by John Rockefeller's Standard Oil Company and uses a bipolar oblique conic conformal projection, provided by the American Geographical Society. Very good. Toning along some of the original fold lines. Light soiling. Verso repairs to fold separations. Small areas of infill along middle vertical fold at fold intersections. Text on verso.